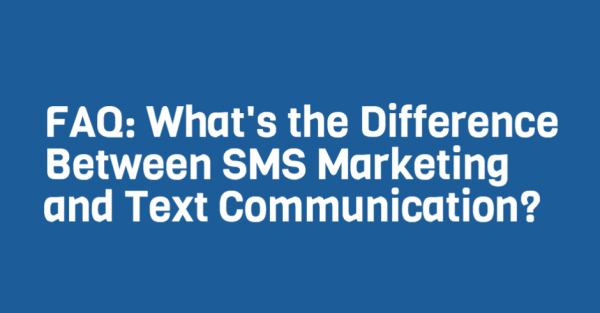 We talk about SMS marketing a ton, but let’s not forget its sister functionality; text communication. SMS marketing is perfect for small business owners looking to increase offer redemption and promote exclusive mobile campaigns. On the flip side, text communication serves as a mass messaging tool. We currently work with thousands of non profit organizations that rely on text communication. Churches find it incredibly useful, as do organizations with 50+ employees. So, how do you decide which one works for you? First, ask yourself this question. Do I want to promote offers, or simply share information? If you’re looking to encourage offer redemption, SMS marketing is the tool for you. But, if you just want to send out mass messages, containing important information or announcements, then text communication is the better solution. To help you better understand, let’s look at an example of each method. You will quickly realize which method makes more sense for your subscibers. We’re giving away free burgers to celebrate our one year anniversary! Stop in today from 6-8PM, and show this text for your free patty, no purchase necessary. Don’t forget! Our Men’s Bible Study meets tonight at 730PM in the West Chapel. As you can see, one focuses on offer redemption, while the other simply shares valuable information. No matter your avenue, make sure you’re always clear with subscribers. Never promise exclusive offers, then only fire out generic announcements. This definitely devalues the worth of your list. Partner up with top online texting service, Slicktext.com. Give us a call at 1.800.688.6290 to learn more, or simply hop over to our pricing page and sign up for a free plan. Our feature rich platform helps even the newest business owner find success with SMS marketing. Looking for a text communication solution? Our platform also offers functionality that makes mass messaging easy and efficient.